"Chkdsk Cannot Run Because the Volume Is in Use by another Process" - What Does It Mean and How Do I Fix It? - Ask Leo! I think I’ve got a problem with my hard disk. I tried to run Chkdsk, but I keep getting this “Chkdsk cannot run because the volume is in use by another process” error. What’s that mean and what do I do to fix it? Chkdsk is an important and little-understood command-line utility that comes with every version of Microsoft Windows. Its purpose, as its mangled name implies, is to “check” your “disk”. In order to do its work, Chkdsk needs complete and exclusive access to the disk it’s about to check. If it doesn’t have that, “Chkdsk cannot run because the volume is in use by another process” is the result. I’ll look at why, what to do, and what it looks like as it happens. Chkdsk requires exclusive access to a disk in order to make repairs. “Chkdsk cannot run because the volume is in use by another process” results when any other program is accessing the hard disk. Windows itself is often that “other program”. Running Chkdsk as part of the next system boot is the most common solution. Start a Windows Command Prompt as Administrator. Run the command chkdsk, including either the “/f” (fix filesystem information errors) or “/r” (repair disk physical errors) options. As you can see, “Chkdsk cannot run because the volume is in use by another process” is the result. The “other process”? Windows itself. Chkdsk is, as its name implies, a disk repair utility included in Windows. For more about what it does and why it matters, see Chkdsk: What Is It and How Do I Run It? If any other program has a file open on the disk, it’s considered to be “in use”, and Chkdsk can’t get the exclusive access it needs. “But I have no programs running!” I hear you say. Yes, you do: Windows is running. In fact, Windows has several files open, including the files containing the registry, the system paging file, and the executable files that make up Windows itself. Chkdsk cannot fix or repair a drive from which Windows was loaded while Windows is running. While getting this error on the Windows drive is the most common, it’s certainly not the only case. Let’s say you have a drive “D:”. If you have Windows File Explorer open on drive D:, or perhaps have a document open on that disk, the same situation applies. The solution is easier, though: close those programs. Make sure nothing is accessing anything on that drive and try again. You should be good to go. Unless, of course, you happened to have moved your paging file to D:, in which case you’re back in the “can’t do it while Windows is running” situation, since the paging file is always open while Windows is running. Answer the question with a “Y” for yes, followed by Enter, and Chkdsk will run the next time you reboot Windows, before Windows itself begins to run. That’s the only time Chkdsk can have the exclusive access to the system disk it needs. When you reboot, the reboot will proceed normally, until the screen changes to give you the opportunity to skip disk-checking. Skip Chkdsk on boot option. As the message indicates, you have a few seconds to press any key on the keyboard to skip the disk check, after which Chkdsk proceeds. Chkdsk running at boot time. 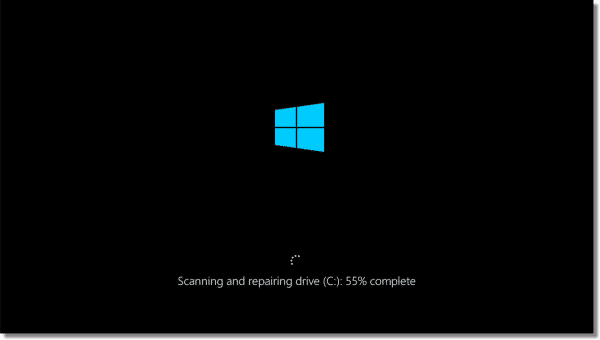 Once Chkdsk completes, the computer should reboot and load Windows normally. Information generated by Chkdsk running at boot time is saved to the system event log. The article How Do I See the Results of a Chkdsk that Ran on Boot? shows you how to view it. “Chkdsk cannot run because the volume is in use by another process” simply means that in order to fix your hard disk, Chkdsk needs to be the only program accessing it. For some drives, that’s as simple as closing the programs that are active on the drive in question. For the system drive from which Windows was loaded, it means you need to allow Chkdsk to run the next time you reboot. Actually what you’re seeing is a separate copy of Windows 7 running in a virtual machine. I can capture the entire boot process and more that way. I happen to use Parallels Desktop. Do you have to buy Windows again, that is run inside a virtual machine or is that included with the main license? More than likely you will have to buy a copy to run in a virtual machine. Sometimes a person may have an old copy that they can use – but the legality of that could be sketchy. Windows in a VM is, essentially, a completely different machine so would require its own license. What is the difference between “/F” (fix) or “/R” (repair) when choosing those options? Fix fixes logical errors (confused data), and Repair looks for physical defects. /r locates and repairs bad sectors. It also includes the functionality of /f. 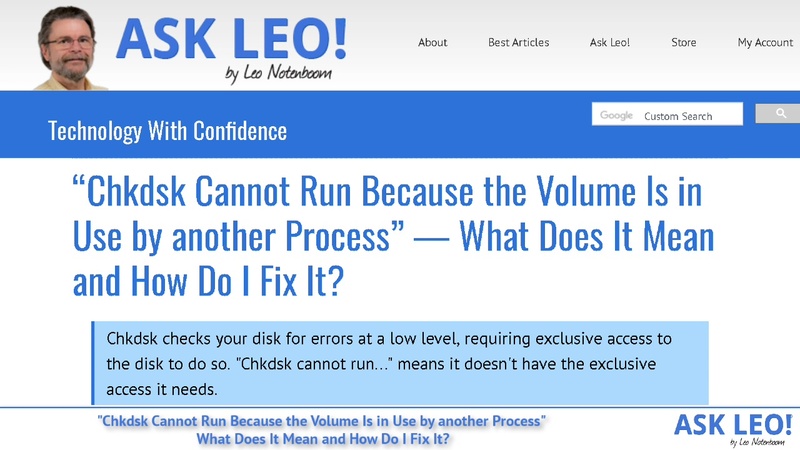 Hello Leo, Yes, “chkdsk” is a valuable tool and i like to run it on my machines at least once a month or so, but it is time consuming as well. I like to go about doing it a little differently. I go to the “C” Drive’s properties window, click on the tools tab, then check the box under error checking labeled check now, which then brings up the check disk window. the automatically fix file system errors box is already checked, be sure to check the box for Scan for and attempt recovery of bad sectors. Then start. You then get the proverbial “Windows can’t check disk while in use, do you want to check for errors the next time you start your comp. Click the schedule disk check box, Restart. I do this before i retire for the night & the next day check and see the results. Keep up the great work Leo! I’ve been a faithful subscriber for years! J. Is it legal to run Windows inside a virtual machine? Chkdsk is not included with every windows. it is included with xp or greater. In Windows 9x it was called scandisk I believe. I do believe it’s legal, assuming you have a legal copy of Windows, of course. What is the disk fixing? Parity? I load JPG files from my camera’s memory card and when I back up the hard drive to my external back up drive, an error occurs which stops the process. I wondering what conclusions I can draw from this. Is the hard drive failing or are corrupt files from my camera being copied to the hard drive. An if this is the case, why can I copy from the memory chip to the hard drive and then be disallowed from copying the hard drive to an external disk drive with the same copy command? This would be a hard disk problem, though not necessarily that it’s about to fail. CHKDSK or SpinRite would be my suggestions. In XP Home, Start, Run, eventvwr, Application tab, then look for Winlogon files. These files are more readily found by clicking the Source column header, found at the top, to show the results in an alphabetical list. Clicking twice presents the list in reverse order so that Winlogon is likely right in front of you. Not all Winlogon files will be Chkdsk data, but most will be, likely. Double-clicking a file will render a small window of data where you can review the Chkdsk results. Further, UP and DOWN arrows, to the right, will navigate, as expected, and a copy button (double paper button below arrows) will copy the report to the clipboard which can be pasted into Notepad or WORD to preserve their history. I’d have to know what steps you take – exactly – to start chkdsk, and if you see any evcidence that it ran at all. You might also look in the event log: How do I see the results of a chkdsk that ran on boot? Leo, thanks for your detailed information on chkdsk, running chkdsk finally allowed me to delete a folder on my desktop that had been haunting me for some time. I run a dual boot system Windows 7 64 bit alongside Linux Ubuntu 11.04, I believe my issue was that I copied some files from Linux into a Windows folder which had special characters in their names. I believe this is the case since I can access drives on the Windows side from Linux but not the other way around. I am trying to reset my computer to an earlier date but I receive an error message as follows, system in use also I have tried to do command prompt as described in your blog but comes up error not alowing fix or repair disk after already saying yes to repair upon reboot what can I do. i also do not have a Windows 7 disk my computer came preloaded with windows 7 home premium 64 bit with 2 point touch please can you help me. how to fix the drive on which windows exist?????? Read the article you are commenting on. To do that, you would simply follow the instructions in this article. here’s the problem… I haven’t installed any software for the last 6 months. Try booting from external media (like a CD ROM drive or a USB drive) and then running chkdsk using the /X option to dismount the drive. Then nothing is running off your main hard drive, and chkdsk will be more likely to run without this error. It worked for me. A good way to do that is to create a system repair disk, boot from the system repair disk, and then run chkdsk from the system repair disk instead of running chkdsk from your harddrive. Exclusive access of hard disk is demanded during defragmentation of drives too! When my computer reboots, chkdsk (autochk) still gets an error. checked the next time the system restarts? (Y/N)” I type y amd it tells me it’ll run next time the system restarts, but when I restart the computer, restart is perfectly normal. It skips over the chkdsk. Help??? This happens to me on Windows 7 professional. Chkdsk won’t run after a restart. I found this to be true and have another way to do this. I use Glary Utilities and it is part of their clean-up process to do this which is done at the next start-up of your windows program. They also do an excellent job of cleaning up old files, etc. I have a problem where I continue to get the same message that “chkdsk will not run because the volume is in use by another process” even when running the disk check on boot-up AND when running the disk check from command in recovery drive X (recovery options), on windows 7 home. Any ideas about how to fix this? Specifically, I want to stop getting this message on boot-up and be able the check the disk on boot-up.